I received a package from Crazy Dog T-Shirts last week and I was totally happy with them! 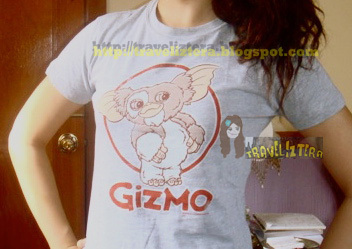 I am a huge fan of GIZMO (from THE GREMLINS) and THE BIG BANG THEORY, so check out the items I received! "Bazinga!" - Sheldon loves to say that whenever he's "telling jokes". "Crazy Dog T-Shirts" has a lot to offer. They have funny, inexpensive, cool, graphic, vintage, 80s, and custom t-shirts which you will totally love. They have a line-up for both men and women of all sizes and personalities, giving everyone an opportunity to own one of their amusing creations. Check http://www.crazydogtshirts.com/ now to start choosing the shirt that fits your style and personality! HOW IS THE THICKNESS OF THE SHIRT? Waw. Talagang todo-posing para mapromote ah! LOLOLOLOL. Hi Michael! Hahaha syempreeeeee! Kelangan todo posing ! hahaha! Wow tignan ko nga ung yesstyle! D ako kpopper pero minsan nakikinig ako haha! halos lahat ng friends ko maka-KPOP e! hahaha! weeehhh..ang cute nung damit at nung may suot.. wahahahaha..
MD - hahaha nakikita ba mukha ko ? HAHAHA pilosopo e noh haha! ang cute naman ng shirts. Awhhh.. you are back! Those t-shirts are so cute! I so adore the prints! whohoho. aba. papapayat muna ako bago mag shopping jan.
nice poses mo ah!! hihi. Aww.. the shirts are so cute. At todo-posing talaga ha.. Hehe.. Nice! I'll ask D nga to get me a shirt. 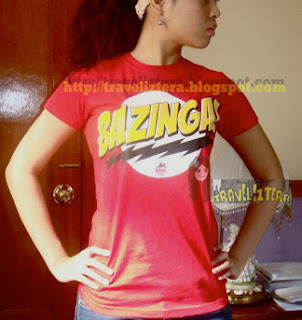 I like the Bazinga shirt. Hehe. Nice to see you blogggging. Enjoy the rest of the week. Those look great! I'm not much of a T shirt wearer, but I like the prints! i'll check 'em out. I love tees esp graphic designed shirts. ganda ung shirt pero mas maganda ung nagsusuot... naks... d shirt is pretty cute though... from six bucks.. not bad ang price... nd haha... natawa akoh sa komentz ni glentot... lolz... so yeah napadalaw sau ms. pretty traveliztera... ingatz.. Godbless! Veliz! sayo ako naktingin hindi sa t-shirt.. todo post eh.. haha! Lemme at the Bazinga shirt!!! i want! oh, and i forgot to ask. you bought them?